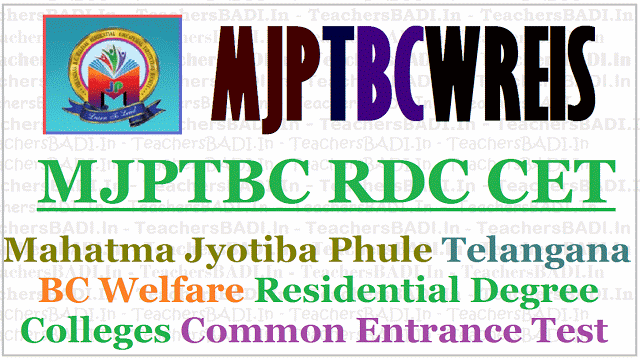 #MJPBCWRDC CET 2019, MJPTBCWREIS RDC CET 2019 Hall Tickets/Mahatma Jyothiba Phule BC Welfare RDC CET 2019 Hall Tickets/ Telangana BC Welfare RDC CET 2019: Mahatma Jyothiba Phule Telangana Backward Classes Welfare Residential Educational Institutions Society(MJPTBCWREIS) issued the Residential Degree College Common Entrance Test(RDC CET) 2019 notification in March, 2019. Telangana BC Welfare REIS invited the online applications from the eligible students who were passed inter or inter appeared students for admission into Degree course in MJPTBC Welfare Residential Degree Colleges in Telangana State for the academic year 2019-2020. Eligible students were applied for this stream from 12-03-2019 to 08-04-2019 through online mode at its official webportal. RDC CET 2019 applied candidates are waiting for their hall tickets for attending the entrance test. This entrance will be held on 21-04-2019. MJPTBCREIS official will upload the hall tickets of applied students on its webportal soon. So, Telangana BC Welfare RDC CET 2019 applied students can download their hall tickets from mjptbcreis website. Candidates can download their Hall Tickets from the website at mjptbcwreis.cgg.gov.in from 18-04-2019 onwards with the reference number allotted to them. Candidates have to download the hall tickets from the websiteonly. No printed hall ticket shall be issued/posted to the candidate.